Umpire Jerry Layne was knocked out of Monday's Indians-Braves game on a foul to the jaw in the 8th inning of Cleveland's eventual victory. With one out in the bottom of the 8th inning, Braves batter Nick Markakis fouled a 92-mph fastball from Indians pitcher Tommy Hunter into the slot and the right side of Jerry Layne's traditional-style facemask. Layne left the contest and was replaced behind home plate by 2B Umpire Hunter Wendelstedt, who served as acting crew chief alongside base umpires Tripp Gibson (1B) and Adam Hamari (3B). 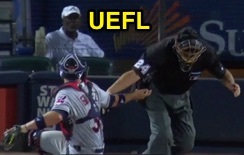 Most recently, Triple-A umpire Chris Segal was called up from Gwinnett, Georgia to fill in at Turner Field on Saturday when Mike Everitt became involved in a police pursuit on his way to the stadium; the Gwinnett Braves are presently on a road trip. Layne's most recent injury was to his right leg on April 19, 2016, resulting in Nic Lentz' Major League debut. He most recently left a game due to a deflected ball injury to the mask on April 15, 2015, when catcher Francisco Cervelli mishandled a ball four pitch.